I’ve been craving waffles, and cheating and buying the frozen ones. First of all, I hate buying almost any convenience food. They’re usually packed with not-good-for-you stuff. And even if they’re a healthier version (I buy the low-fat waffles because they’re the lowest in calories), they’re still not usually packed with great stuff. Or those who claim to be, do they ever taste as good or seem as healthyas homemade? Not to me! Plus, I live alone. So I can make up a batch of something like waffles, freeze the extras, and with a little bit of work, have homemade waffles a few days a week for weeks! I started with this recipe as my base, and adjusted it a little to the recipe shown below. 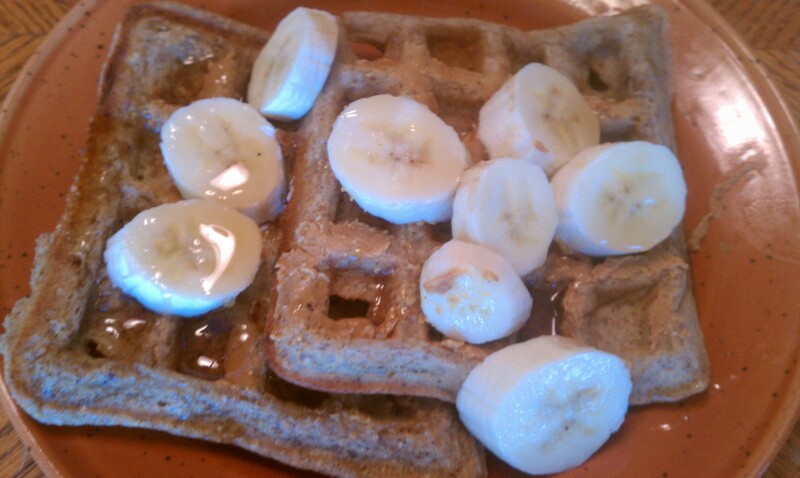 My recipe yeilded 11 waffles at 167 calories, 8 grams of fat, 22 carbs, 3 grams of fiber and 5 grams of protein a piece. I was starving so I had two for breakfast this morning with about 1 Tbs of peanut butter, 1 banana and 1/8 cup of light syrup. Grand total for breakfast was about 600 calories. That’s a little heavy for me. I try to be around 400 calories. So next time I’ll probably do one waffle, fruit and maybe an egg. Stir together the dry ingredients in one bowl and the wet ingredients in another. Mix the wet and dry ingredients until just-mixed. Heat your waffle iron and make waffles! I let mine cool on a cooling rack then wrap them individually in either foil or plastic wrap and store in a freezer bag. When I’m ready to eat one, usually toasting works well. Sometimes I’ll zap them in the microwave to thaw then put them in the toaster. It really depends on how thick the waffles are and what my toaster wants to accomplish! These things were so delicious. I LOVE the way seven grain stuff tastes. I could eat 7 grain bread until I have 7 grains coming out of my eyeballs! Previous Meatless and Hungry! Next Do Diet Drinks Cause You To Be Fat? Or Do You Drink Them Because You Already Are?